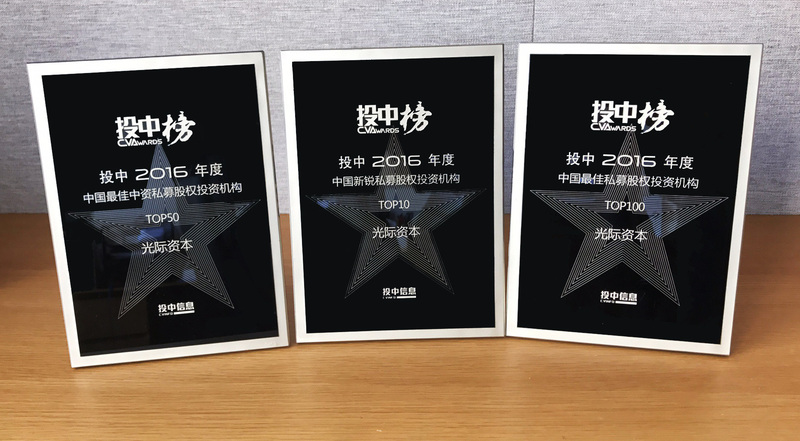 On April 12th, 2017, Everbright-IDG Industrial Fund (“the Fund”) joyfully announced that the Fund was awarded with “Top 10 of 2016 New Investment Institutes of Private Equity” in the annual list of CVCapital, “Top 100 of the Best Investment Institute of Investment and Institute of Private Equity” and “Top 50 of the Best Investment Institutes of Chinese Investment and Institutes of Private Equity”. Until 2016, there had been tens of thousands of active VC/PE institutes in Chinese market of equity investment, having management capital of RMB 700 billion. There is no doubt that the progressive evolution of market in the last decade has changed the pattern of Chinese VC/PE industry. However, investment institutes still face great challenges in the fierce competition of fund-raising, investment, management as well as withdrawal. As the new strength in Chinese investment of private equity, Everbright-IDG Fund remains robust and develops constantly. The Fund ranks the first among Chinese PE institutes as a dark horse this time, proving that it has been confirmed and appraised by the third rating institutes for its achievements in equity investment. The Fund benefits from the two-wheel model of “industry + capital“ from Silicon to Beijing and from Italy to Shanghai. Insisting on the most competitive resource allocation worldwide, it has an eye-catching performance after being established for less than one year at increasing speed. Practicing the idea of value investment, the Fund pays attention to the first-line projects as well as leading or potential leading enterprises, especially those with mature business models and potential leading enterprises with high market recognition in the market segment of financial technology, pan-entertainment, education and other fields. The Fund is committed to being the most influential M&A fund in China. Until now, the starlet in fund, the Fund completes the investment in about ten large star projects, including the Chinese leading video enterprise brand (iQiyi), the world’s largest non-listing cross-border mobile e-commerce platform (Wish), the leading electric vehicle manufacturer in China, NIO, the largest bank card acquirer and internet payment leading company in China, ChinaUMS, the acquisition of European lighting giant (OSRAM) as well as Shanghai Film Art Academy in just 10 months. The Fund has successfully captured many global unicorn companies and has invested more than RMB 15 billion in total. All of these investment projects spread in various countries and markets all over the world, realizing cross-border and multi-currency equity investment. The rapid growth of Everbright-IDG Fund which has drawn attention from the whole industry is not an accident, but a process of abrupt rise based on accumulated strength. The investment group jointly established by CEL and IDG Capital mainly focuses on the deep layout and resource integration in the complex and changing environment of global economy, so as to get through the resources and advantages of both parties. Furthermore, unique investment and transaction models of M&A funds are applied to realize, invest and cultivate “giant unicorns” and also help the enterprise grow stronger. In the future, Everbright-IDG Fund will continue to grasp the historical investment opportunity brought by industrial update and be engaged in creating the most influential industrial investment fund in China to provide richer investment return to investors. “China Investment Meeting”, which was held by CVCapital is a premier event in Chinese field of private equity. “CVCapital Annual List” strives to accurately present the competitiveness of all Chinese PE/VC investment institutes in the industrial investment field.